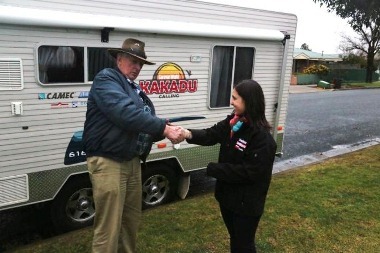 Congratulations to Graham Smith of Wodonga, Victoria, who is now the proud winner of our Coromal Kakadu Caravan prize package worth over $50,000. This competition, which ran over six months and received over 70,000 entrants, ran in four of Bauer Trader Media’s titles, including Camper Trailer Australia, Caravan World, Motorhome & Caravan Trader and Blue’s Country magazine. The winning coupon came from Caravan World magazine, to which Graham has been a subscriber for two years. This amazing prize package was delivered to Graham and his wife Maria’s house. 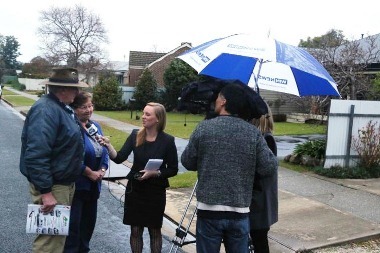 The local Border Mail newspaper and WIN News were present to capture the handover and Graham’s first reactions to the prize. From our point of view, Graham is a deserving winner on account of the fact that he’s travelled the country in caravans for over 30 years. “Our children were basically brought up in caravans as we travelled all the time,” said Graham. “We have had about seven or eight vans in our time and this is the perfect addition for our next adventure,” he added. 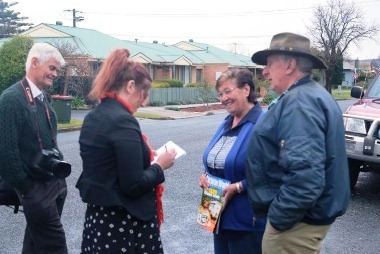 Graham and Maria already have a trip planned to Queensland where they plan to take the Coromal on its first adventure. “We have never won anything and we were in disbelief until we received a letter from Caravan World. You never think people actually win this stuff,” Graham said. Maria went on to say: “Our friends did not believe us when we told them. We will be inviting them over to show them we actually won! On behalf of all the Bauer Trader Media titles involved and especially our sponsors — Coromal, AeroPlus, Camec, Dometic Group and Generator Place — we congratulate Graham and Maria.